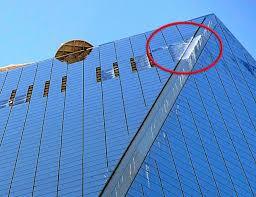 Thankfully nobody suffered personal injury in New York after big chunks of ice fell from the Freedom Tower and other buildings from the World Trade Center. Ice patches have been forming on the the sloped roof of the freedom Tower as well as the rounded corner areas. Because the building is still under construction, it is not heated, allowing the ice to build. When the temperature rose at the end of the week, the ice started to melt. Big chunks fell on the ground putting pedestrians at risk of a catastrophic head injury or death. The Police finally closed the street after pedestrians had to run for cover several times. The CDC estimates that every year in the United States 15 people will die from falling ice injury.